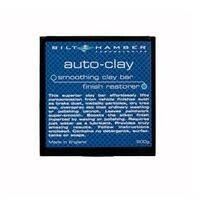 Bilt Hamber auto-clay medium 200g is an easy-to-use paint cleaning clay that provides a fast and efficient method for removing embedded particulate contamination from vehicle paints and clear coat finishes. Bilt Hamber auto-clay medium 200g is an easy-to-use paint cleaning clay that provides a fast and efficient method for removing embedded particulate contamination from vehicle paints and clear coat finishes. The extremely small and soft particles that make up the soft pliable mass ensure that the clay is as gentle as possible to the paint surface while imparting a powerful pulling action on the embedment. Needing only tap water as a lubricant, or a lubricant such as Bilt-Hamber auto qd the big 200g bar is economic, efficient and made in England. Supplied in a quality storage box and with full detailed instructions. Contamination can consist of tiny metallic particles from rail dust, brake dust and industrial fallout; or non-metallic substances such as tree sap, bird droppings or insect residue. It affects all paint finishes and can cause serious damage when left untreated. Surprisingly, even brand-new cars and trucks can suffer from paint contamination. Metallic contamination is perhaps the worst offender; whilst stuck into the paint surface it corrodes and expands leading to the onset of paint film destruction. Paint contamination can be felt as a rough or gritty texture on the freshly cleaned paint's surface. This contamination cannot be removed by washing, waxing and/or polishing. To assess the degree of contamination on you car's finish simply rub your fingers gently over the freshly washed paint - to magnify the sensation place a piece of cellophane beneath your finger tips and gently rub back and forth - if your paint needs to be clayed you will feel the gritty texture. It is usual to find that horizontal panels such as bonnet roof and boot lid are the most affected. auto-clay removes these particles effortlessly from contaminated surfaces leaving a glass smooth ultra clean finish perfectly prepared for the application of waxes and other final stage products. This contamination cannot be removed by washing, waxing and/or polishing. Cutting compounds remove a thin layer of paint but still leave the embedment behind.